The Rotary Club of Ambergris Caye (RCAC) has been brainstorming on fundraising methods to support all of their projects that benefit the island community, and recently they have launched two new ways of collecting the much needed funds. 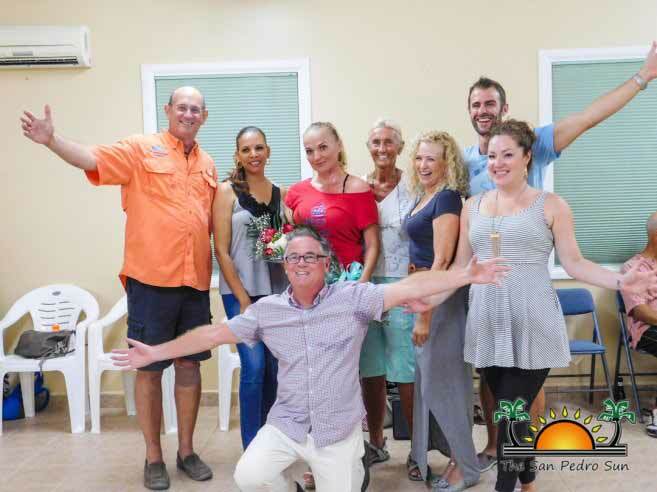 On January 16th they launched their “Let’s Dance” ‘funraiser’ at the Banyan Bay’s Conference Center. Under the instruction and expertise of professional dancer Zuzana Maros, attendees are able to learn swing, salsa, modern, bachata, merengue and other Latin-inspired dances every Monday from 7PM to 9PM. The class is geared to couples and singles, 21 years and older, and costs $25BZ per class, or $20 per class with a 10 pass card, and $15 for all Rotarians. On Friday, February 17th the Rotary Club announced the installation of two donation boxes inside the terminal of Tropic Air. Originally used as bus fare collection boxes, the containers were retro-fitted especially for their purpose by Rotarians Marci Price and Clark Hicks. The project was baptized with the name ‘Change Fa Change,’ which asks departing visitors to donate their extra change in an effort to help fund community projects on the island. Another project will directly work with the children of San Pedro. Tabony indicated that the Club has been assisting with softball sessions on Wednesday evenings, for the San Pedro Kid’s Club. “We have been helping in sourcing volunteers, raising funds for softball equipment and marketing the club,” she said. The continuation of this program is considered by the Club members as vital since it provides a fun safe, place for after-school activities.